ROME (AP) — Wales equaled its century-old national record for consecutive wins after overcoming a plucky Italy side 26-15 in Six Nations rugby on Saturday. Italy scored the only try of the first half to trail by 12-7 at halftime. Wales didn't score a try until the 53rd minute and finished with only two. Italy scored a second try, too, but too late to prevent Wales from an 11th successive victory, tying the Welsh record set 109 years ago. Coach Warren Gatland made 11 changes after the fortuitous win over France in Paris last weekend, and a comfortable win at Stadio Olimpico was on the cards as Dan Biggar kicked them to a 12-point lead in the first half hour. But Italy struck from an attacking lineout as Dean Budd and captain Sergio Parisse surged. Sebastian Negri and David Sisi helped in getting flanker Braam Steyn over the line, and the game descended into the tight content the Welsh feared. Tommaso Allan converted Steyn's try but hit the post with a penalty just before halftime. He nailed a penalty after the break to cut the deficit to two. Wales finally hit back with converted tries by Josh Adams and Owen Watkin to make the result safe with 10 minutes to go. 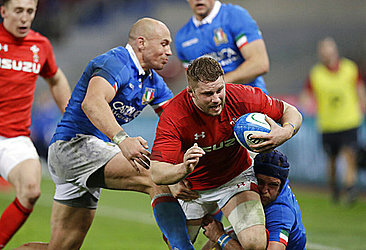 But Wales finished with its least points in Rome in six years. That won't matter to Wales, though, after starting the championship with two wins away from home before returning to Cardiff to face title rival England in two weeks.